Am I a Starseed? How do I know? During my Soul Retrieval session a couple weeks ago, my healer recognized in me this deep desire to love, inspire, and uplift people around me. She said I was a Starseed. That was the first I had heard of that term. I later looked it up and the idea of it is strangely exciting to me. According to Wikipedia, “Starseeds are defined as evolved beings from another planet, star system or galaxy who have come to Earth with the specific mission of assisting its people to achieve a higher level of civilization and peace.” In my own words, I define it as a person who’s soul has a rich galactic lineage and has incarnated in many different forms. Some of those may be of different Extra Terrestrial races. Abilities such as clairvoyance, intuition, empathy, telepathy and the like are common among Starseeds. How do I know it’s for real? I know she’s right, I do have the answers within. But trusting myself is another issue. I decided to go for a long walk and meditate on that. I would ask myself, “Am I a Starseed?” And I would get waves of shivers throughout my body and a sense of joy and excitement within. Ok, interesting. I asked this Universal Intelligence around me, “How do I know?” And I got the intense feeling, “Trust me, you are. You know it!” I realized I was cracking a smile as something inside was celebrating my new found realization. My walking started to quicken as a feeling of empowerment started coming over me. Is it just another label? But here is where my ego comes in. Aren’t I “just making this all up?” It’s not really, real is it? I have no evidence or proof or can’t possibly show someone my Starseed certificate of approval. Isn’t it just another label? You know, like Democrat, Republican, Christian, Atheist, Straight Edge, Punk, etc. When I’ve been shedding my identification with these labels, why would I want to attach another? Carl Sagan said, “We are made of star stuff.” Which in the grand scheme of things is true, we originated from the big bang and we’re just a fractal of the universe. But our souls are infinite and eternal and have incarnated into many bodies and many lifetimes. It’s absurd to think that we are alone in the universe and I know there is more to life than just what’s on Earth. So it makes logical sense to me that my soul could have incarnated into other physical forms in different parts of the universe. I can’t explain it, but I can feel it. I took a few “Starseed Quizzes” online and found that it describes me in a lot of ways. I am naturally drawn to artistic or creative endeavors like art, design, dance, film, etc. I’m a lover, not a fighter – I want to see everyone live in harmony together. I strive to bring people together and inspire them to realize their true inner creative visionary. I feel like I have some sort of mission in life. However, not all the “signs” fit me – such as having a history of paranormal activity, psychic abilities, dreams of distant planets or encounters with ETs and aliens. Not yet at least. Well, ever since my spiritual awakening I’ve been having regular lucid dreams and astral projections. And I’ve been getting more tuned in with my intuition and inner energy. But, it’s not like I’m going to find an answer on an online quiz, I’m just looking outside myself to validate what I feel inside. I tend to do that when I’m learning something new about myself. So if my soul has a rich galactic lineage, where has it been? When I read about different Star Systems, I just took notice of the sensations of feeling inside my body. Some of them I was bored reading. 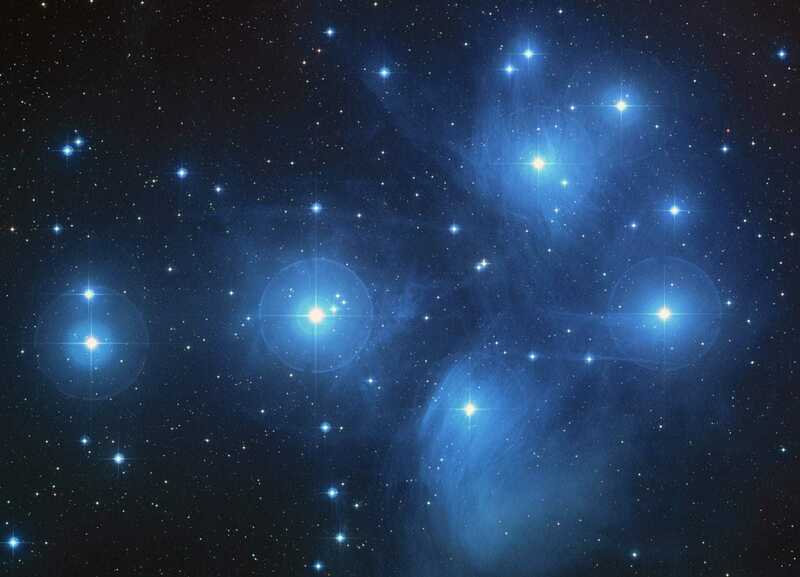 Some of them I thought described someone else I knew… However, when I got to the Pleiades, I started feeling the hairs stand up on my arms, chills of energy flowed down my body again and I had a sense of familiarity. It definitely described me. But I also resonated with several other parts of different star systems… Some of my more evolved spiritual friends told me that we likely come from MANY different star systems and our souls have been a lot of places. It’s all just coming together at this time on Earth because of the big changes happening here. But is my ego just looking for a cool new identity to attach itself to? As I get more into my spiritual path and let this whole thing called life unfold itself within me without judgement or resistance, I find myself getting more connected to esoteric subject matter. This is no exception. But I also worry that my ego thinks it’s a cool club to join for very special souls. And my ego has a history of wanting to feel special. Or is my ego the one causing fear, doubt, and worry about something that is true deep within? I am not sure of the answer. I have a good idea that my ego is the one that doesn’t want me to post this because it’s afraid of what other people will think. It’s afraid of being judged or ridiculed or called crazy. But I do know that I trust my heart. My heart is telling me to be proud of who I am at this point in my spiritual journey. Excitement, hope, joy, doubt, fear, questioning. Follow the path of love and see where it leads. Update: 2/15/2016: I started an Etsy shop called Starseed Supply Co. I make patches/pins for Starseeds and spiritual renegades. Find Starseed Supply Co. on Instagram, Twitter, and Facebook and follow along as the business grows! This is incredible, Jeff. I can not say how deeply I agree with all of this. Thank you for following your heart and posting this. It seriously inspired me more than I can ever say. I long to learn where and who my soul has been. I hope to one day become more soul aware. Thanks Jake! I’m so glad to have inspired something within you. This is an exciting time be be alive, we are becoming aware of our true nature! Agreeded! I feel exactly the same way. Like to the T. I definitely resonate with the Pleiades. I am also curious how things have been since you posted this. Have you experienced repeating number sequences or other syncronicities? Thank you so much for sharing your story even though I know it was difficult. It’s nice for k own we’re not alone. That’s wonderful to hear. Thank you for sharing. Too many people are out there dieing to be a part of something and Jeff after reading this I get an overwhelming sense that your are a fraud not a starseed. Those of us who are blessed to have Pleiadian lineage don’t go on the internet to bost of our new found identity, we have always known it and we share our way of life but not our identity. Without the “bosting” some people might not understand what’s happening to them. I for one am great full of this article to find I’m not alone. While I don’t feel like I am a Starseed, I am fascinated with the idea, and your article suddenly brought back memories of odd dreams and experiences I have had. Looking forward to discovering more of your posts and doing some research of my own! Thanks Jeff! Hey Kelly! Long time no chat! I’d love to hear about your experiences if you care to share. Your mention of lucid dreaming and astral projection reminded me of very vivid dreams I’ve had where I am in multiple places at once. I’ve woken up with strange (not English) phrases stuck in my head. Stuff like that. Never thought much of it other than just me having a weird imagination you know? But I’m really interested in the concept. There’s something about it that resonates with me and just makes sense. Interesting, yeah if you sense there’s something important or more to it than that, there probably is. Let your curiosity and desire to seek guide you. Be an explorer! Oooh sounds yummy, look into it! Let me know what you find! Hi Kirsten! Thanks for sharing, and yes I love what happens to us when we ask divine questions. Quite a feeling, huh? For careers in the healing path that are not nurses, there are energy healers, reiki masters, shamans, counselors, or maybe even an author, blogger, video blogger, artist, musician, etc. All of those could be options for you. I would look into Shamanism and see if anything resonates. Good luck to you! Namaste. That’s so cool Phyllis! Thanks for sharing! Interesting Steve, thanks for sharing the video. I agree with his comment of it not mattering whether you are or not. But being true to yourself without labels. I’ve also heard that “we are all starseeds” as well. Yeah keep yourself open to the possibilities. Try to feel/perceive with more than just your eyes and ears and you’ll be more aware of subtle shifts in your energy. So fortunate that you arrived here on this post. It’s great to meet you. This is one of my most popular posts on this site, and it’s the only Starseed post I’ve written. Write that book if you feel you need to! So cool Sammi! Whatever warms your spirit and gives you inspiration on a deep level, follow that! Tell us about your regression after you get it! Wow Arlee thanks for sharing! I’m a sensitive marshmallow too :-) But I think the whole Starseed thing is just the tip of the iceberg. We all have latent psychic abilities, it’s part of our makeup – it’s just been programmed out of us through culture and our predominant scientific worldview. But maybe the Starseed idea might cause you to find an inkling of inspiration and curiosity, which is a homing signal to follow. Keep following it! If you’re like me, you will get more and more confident the more you know and understand. Feel free to keep us posted! Hey Rohan! Yeah I see 11:11 and repeating numbers a lot too, just started happening in the past 2 years. You aren’t alone! I suggest getting a Starseed Confirmation reading done by Arielle at http://www.starseedhotline.com/checkout.htm#confirmationcheckout – the website looks really outdated, but I have had two readings from Arielle and she’s a really genuine person. The Starseed Confirmation really blew my mind! Hey thanks for sharing. I can understand being afraid to talk about this with people. Your close friends might not understand. You just gotta find your people! This is a good start. There are many Facebook groups too. Or look up #starseed tag on Instagram to find other people. Keep following your curiosity, and what makes you “weird” is part of your greatest gift to this world. You are going up against your edge of your comfort zone. Take baby steps and surf your edge, and you will slowly expand and grow. You are awesome! Jeff, you beat me to the punch at every paragraph. Just as I was asking my own questions, you posed the very same which made me laugh out loud. Thanks for your courageousness in posting. i’ve always wanted to know everything but am getting used to not knowing in order to really know. Know what I mean? I totally know what you mean! The mind wants to take over and run the show and know everything! Thank you! I loved reading this. How do you find a place person to do an astral/soul projection? I need clarity. Hi Viviana, you do the astral projection yourself. Nobody does it to you. Unless you want a teacher to help you do it, then I suggest starting with watching YouTube videos and reading books. Look up authors Robert Monroe and William Buhlman. Jeff Finely If you don’t mind me asking…you had a reading from Arielle about star seed markings. How many markings do you have? When I look at my chart I have one planet that falls on 27 degrees and then my ascendant and 7th house falls in 27 degrees. I did wonder if you had to have a more to fall in the planets to really confirm you are a star seed. Thanks for the article, I enjoyed reading it. I’m doing research to try and figure out where I might be from. I had an awakening in 2015 and at that time a website regarding the Pleiadian’s opened by itself. But, I don’t really feel that I resonate much with the information I’m finding to describe Pleaidian’s. I am influenced strongly by Neptune. Does anyone know what history Neptune relates to? Hi Jeff! I just ran across your blog post here – beautiful nascent story! I compelled to comment on the doubt arising from ego’s need to feel “special.” The ego that is joyfully subsumed by and simultaneously expanded to accommodate the universe is Starseed. The soul willing to claim kinship has manifested it in the willing. Thanks Becky! That’s a good take on the EGO I haven’t heard yet! Thanks for this Jeff! For a while I thought Im going crazy. Now I know. Destiny led me to this article and I shall honor my purpose… Thanks for your courage, Jeff! Hi Sam, thanks for sharing. You might be going through a phase where you are remembering where you came from, and those feelings of “home” are part of what is guiding you toward your true self and mission in this life. Starseeds aren’t totally foreign to Earth, and they may have had many lifetimes on earth, who knows. But what you are experiencing is unique to you and if it feels sacred and meaningful to you, follow it and see where it leads. It’s all unfolding for you. It shouldn’t need to be said, but of course it’s okay to trust your own heart! After all, you know your prime directive for coming here more than anyone else. Thanks Valah, so nice of you to share! Welcome!